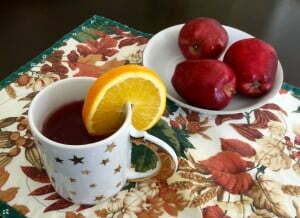 This spiced cider, brewed with fresh apples, oranges, and cranberries, takes little time to make and tastes amazing! Store a gallon in the fridge. On cool, autumn mornings, heat a mug full in the microwave, and sip the steaming, fragrant brew to awaken your senses and warm you from the inside out. Not only is it delicious, but you’ll benefit from the antioxidants and vitamins in the fruit, which help boost your immune system and protect you against colds and flu. And did I mention how fabulous the house smells while your cider bubbles away in the crockpot for three hours or so? Yeah, you have to make this. I’ve been taking a thermos full to share with my students at my early morning yoga classes. Pot of brewed Ceylon or Chai tea (about 4 cups) I use loose leaf tea. Add sugar to the hot tea. Stir until dissolved. Thoroughly wash the fruit. Without removing skin, chop apples and oranges into eighths. 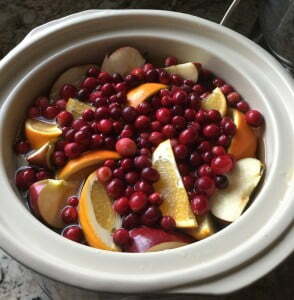 Add apples, oranges, and cranberries to crockpot. Add sweetened tea and water, along with spices. Strain through fine sieve. Return fruit to crockpot and remove spices. Mash fruit. Return liquid to crockpot and cook on high for another 15 minutes. Strain again, squeezing the fruit to remove all liquid. Serve hot in coffee mugs. Garnish with orange slices if you like. Also good served cold.